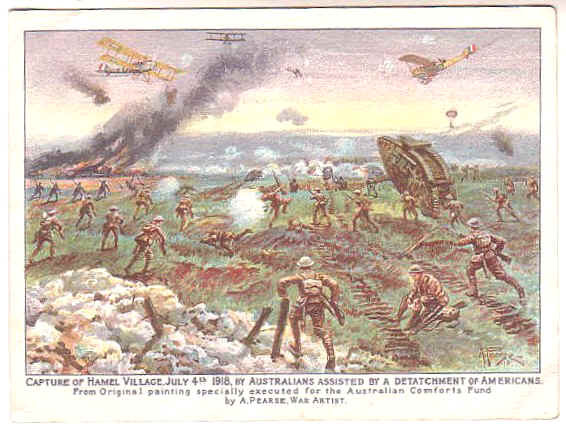 Although the strategic goal was limited, the significance of the battle of Hamel on the morning of 4 July, 1918 was its standing as a prelude to the success of precise coordination between combat services and meticulous planning. Both achieved by the brilliance of Lieutenant General Sir John Monash and his Divisional Commander Major General Ewan Sinclair-McLagan. Lt. Gen Monash proved himself at the Battle of Messines, under the leadership of General Sir Herbert Plumer, from whom he learnt the conference model which was implemented in the planning of Hamel. Monash also adopted the use of military technology, such as tanks, planes and immediate communications to “break the back of the enemy” and avoid unnecessary casualties of the infantry. Hamel is also remembered as the first occasion American soldiers, still yearning for combat experience, fought alongside war weary veterans of the Australian infantry. The success of the 93 minute battle is a testament of finely tuned Australian infantry under superb field commanders and their indomitable Corp commander, Lt. Gen. Monash. Mr Robert Muscat is the Vice President of the Society with an interest in military history. He is a secondary school Principal and once a Rifleman in the Australian Army Reserves. Although entry is free a gold coin donation is appreciated. RSVP is essential by Wednesday 4th July 2018 as numbers are restricted.